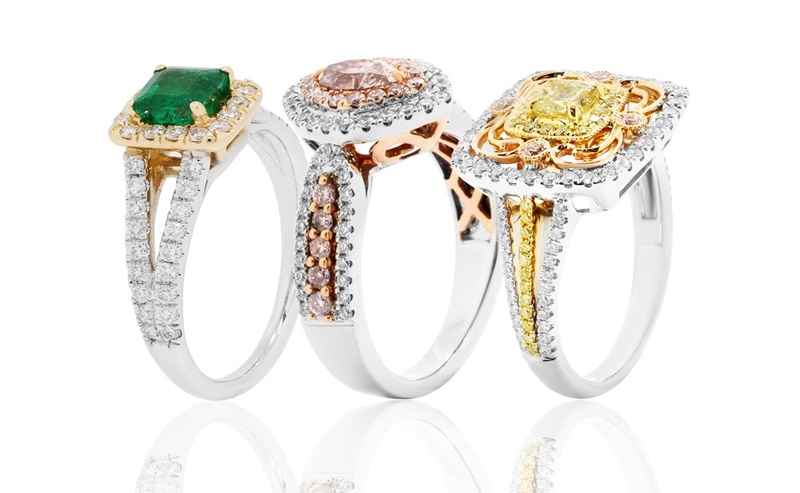 Get Fancy: Engagement Rings with Color! “Fancy” or colored diamonds are a rare and beautiful addition to any engagement ring. Breaking from the tradition of the colorless diamond ring, fancy engagement rings make a bold, brilliant statement and will immediately grab attention for their unique style. When designing a fancy engagement ring, you first need to decide what color is most appealing. Diamonds come in a spectrum of colors—canary yellow, brown, champagne, orange, pink, purple, green and blue. There is no “best” color of a diamond, but the purer the color, the more valuable the stone. Prepare your budget in advance if you want to invest in a vivid fancy diamond, because color doesn’t come cheap! 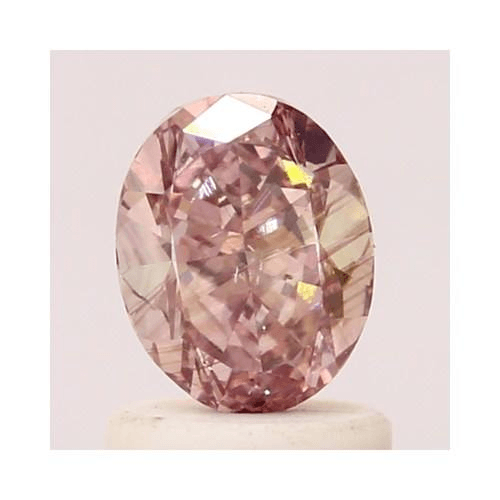 More saturated diamond colors—like deep pink or blue—can command tens of thousands of dollars, which means you need to know what you are purchasing is legit! Before you buy any fancy diamond, be sure that the stone is certified. Otherwise, you may just be buying a colored gemstone—or worse, a completely fake stone. Your stone should be certified by one of the notable diamond laboratories like the Gemological Institute of America (GIA). The diamond’s certification paperwork also should note the color of the diamond. We advise against purchasing a fancy diamond that isn’t certified! The color of your fancy diamond should be showcased, so choose a setting that ensures the color pops. Dark hues like deep pink, blue, and yellow diamond engagement rings look amazing when set within cool metals like platinum or white gold. Warm yellow gold flatters warmer hued diamonds—like champagne, brown or orange. 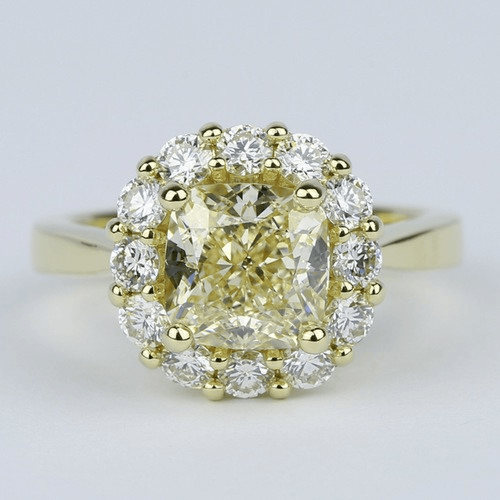 Yellow diamonds also look amazing in yellow gold. 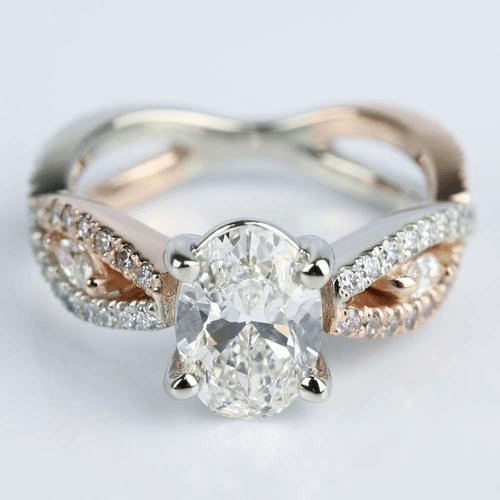 Rose gold and rose-inspired engagement ring settings add a romantic touch to any design featuring a fancy pink diamond. Fancy diamonds don’t often exhibit the same fire as colorless or white diamonds. If you want to add a spark to your fancy diamond engagement ring, set white diamond side stones next to your colorful center stone. Or you also can encircle your fancy diamond with a diamond halo. When creating your fancy diamond engagement ring, you may wonder how the 4C’s of the diamond grades affect a colorful stone. Like colorless diamonds, you’ll want to look for good clarity, cut…and, of course, make sure that your stone’s color is also noted. Carat weight of fancy diamonds greatly affects the price—and we mean greatly! Saturated hues like deep pinks or perfect blues can command prices in the five to six figures. Rarity, after all, comes with a price tag! 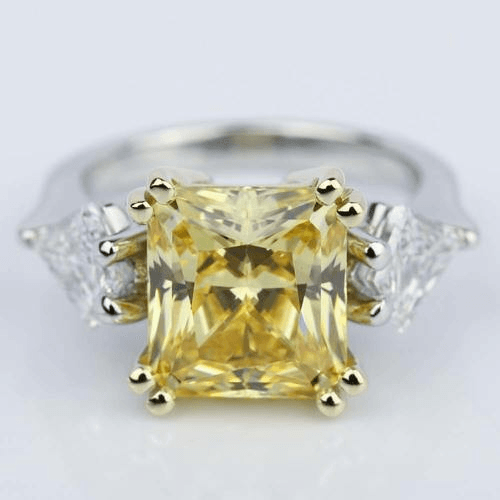 In some instances, it may be cheaper to purchase a loose fancy diamond to get the best diamond for your budget, then find or create the setting to accommodate your sparkling gem! Since fancy stones are such an investment, many buyers want them to remain the center of the ring…so they choose a solitaire setting. Solitaire engagement rings allow the fancy diamond to really command all the attention, so the metal choice of the setting is important. Remember to choose cool metals for bolder-hued stones. 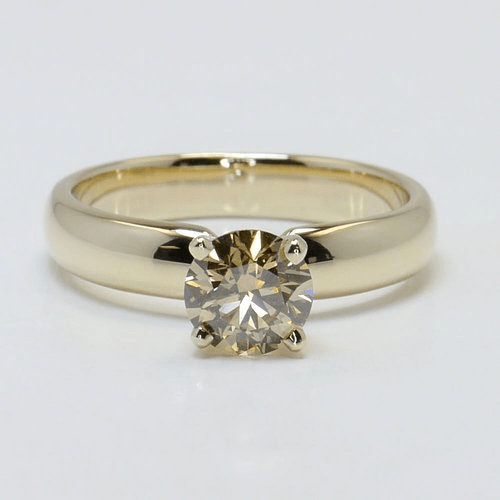 Solitaire engagement rings, however, don’t have to be plain bands. You can choose bands with intricate floral patterns or other details to flatter the shape and hue of your stone. Fancy diamonds are colorful, rare and a unique choice for engagement rings. The rare beauty, though, comes with a heftier price tag. When choosing fancy colored diamonds, always insist on seeing the diamond’s certification…and only purchase fancy stones that have been certified by a reputable gem laboratory. These stones are an investment, so you have every right to insist on knowing that you’re buying the real deal!